RTL1090 software download and link page for our historical software solutions. Jetvision provides ADS-B dongles for starters, hobbyists and enthusiasts. All the software stuff on this site is NOT longer supported. All software versions are from the past and we give no warranty. 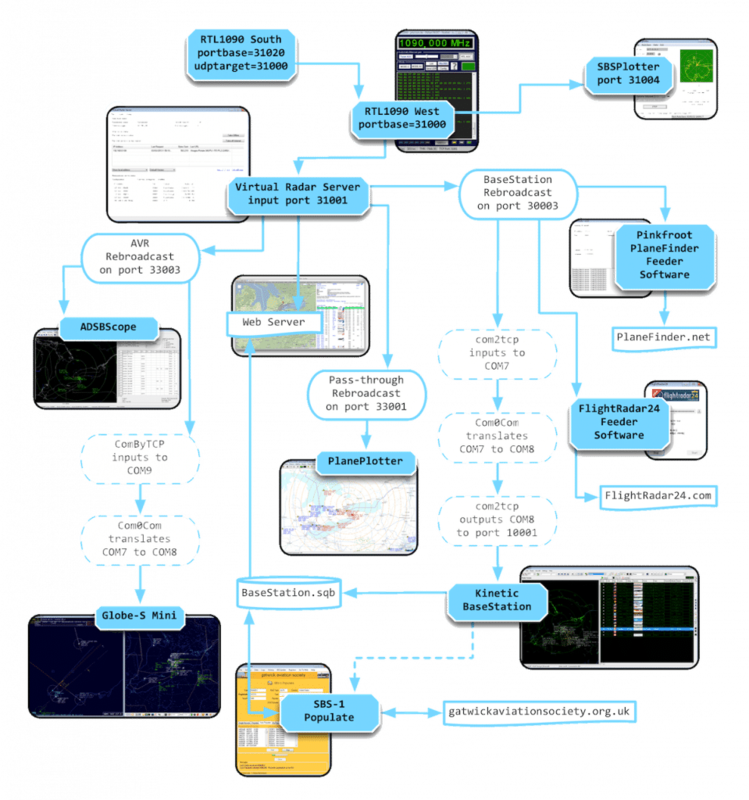 You can download, share and use this software packages for your own environment. Remember, there is no support for installation, troubleshooting or other issues. For any assistant and help there are some forums in the internet. We we have some links for that. Thanks you for understanding. If you are interested in professional ADS-B receivers, 1090 MHz antennas, MLAT server and FLARM, visit our website. 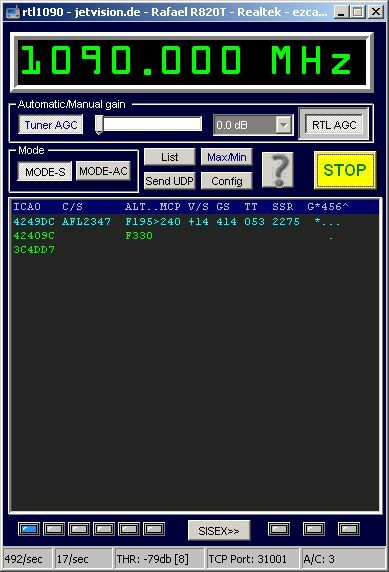 The genuine version for Planeplotter, Flightradar24, Virtual Server, ADS-Scope, Globe-S RTL and other ADS-B software. This version is depreciated. It must not be used for MLAT GS/MU purposes in the Planeplotter network. This internet based utility helps you with setting up a complete RTL1090 installation with almost no manual intervention. It automatically downloads the relevant files as rtlsdr.dll, zadig.exe and helps to configure zadig with a built in tutorial. Just place and start the utility in the RTL1090 target folder (do not use a "C:/program" folder to avoid administrator problems). This is the basic stable exe file of RTL1090. If you use IMU there is no need for a download, unless IMU encounters difficulties of some kind. 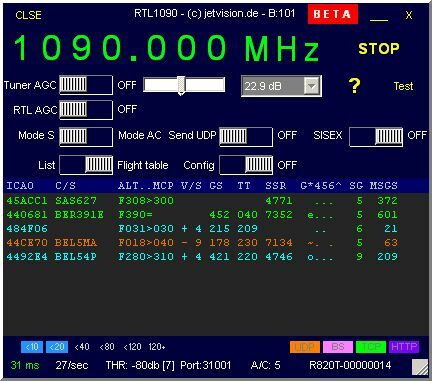 This is a beta release of RTL1090 V3 "SCOPE". Unzip the files to your current RTL1090 installation folder and start rtl1090.beta3.exe. Please observe the README instructions for use. V3 retains full downward compatibility to V2 and can be used for MLAT purposes etc. as V2. It just adds a scope and some additional functionality to V2. Group Description RTL1090 is a DVB-T dongle to Mode-S converter app . Supported dongles: RTL2832U interface+tuners: E4000, R820T (latter preferred) Designed for Windows (any version). Mode-S and Mode A/C decoding with TCP server. Data output encoded by Beast Binary or AVR Coding, compatible to Planeplotter, including multilat capability MAX/MIN function can test frequency band edges and reception gaps. Fully automatic operation. Flight list. Multi-dongle operation. RTL1090 FAQs on this page. The list runs down so fast. How can I read the system messages right after start-up? Start the app, then disable TUNER AGC and RTL AGC. Close and restart the app. Now all system messages will not be overwritten because it is unlikely there are signals to be displayed. Where do I find the relevant files? How do I upgrade to a new build? Just download, unzip and overwrite the rtl1090.exe file. Close rtl1090 before. Where can I find the latest app build? I have plugged in a R820T, but cannot connect. I have installed and plugged in a R820T, but it says "Dongle not found" (on a DELL machine). I run a WIndows 64-bit OS and cannot connect to my dongle. Be sure you have installed the rtlsdr.dll from the rtl-sdr-release/x32 folder, NOT the /x64 folder. I have plugged in a R820T/E4000. Windows says "Installation complete. Device can be used." But I can't connect (error -12). Most likely you had installed a DVB-T driver before, that recognizes the dongle for TV. You need to overwrite this driver with the Zadig driver in Bulk-in, interface 0. Do not use interface 1, this is the infrared port. I have plugged in a R820T/E4000, but cannot connect (error -3). Be sure there is no other instance of RTL1090, adsb# or another SDR radio running in the background. I have plugged in a R820T/E4000, but cannot connect (error -12). I run Windows XP. When do I need to reinstall a ZADIG driver? UPDATE: Reports received that Zadig drivers become lost after some time and reinstall is necessary. This seems to be connected to automatic Windows updates. See the Operating Manual for installation instructions. When executing the Zadig driver installation a message pops-up that says: "Exception_handler4 ..."
Just click the message away and ignore it , the installer will finish succesfully. have installed RTL1090 as instructed, but when I try to start the app, nothing happens. The DLL msvcr100.dll, that usually resides in the Windows folder, cannot be found. Download the DLL from the internet and place it to the app folder. What is the recommended gain setting for the stock whip antenna? What is the recommended gain setting for an outside antenna? What is the output format of RTL1090? What are the blue LEDs for? What is the green LED for? What do I need to upgrade from E4000 to R820T? Nothing. Just swap the dongles. 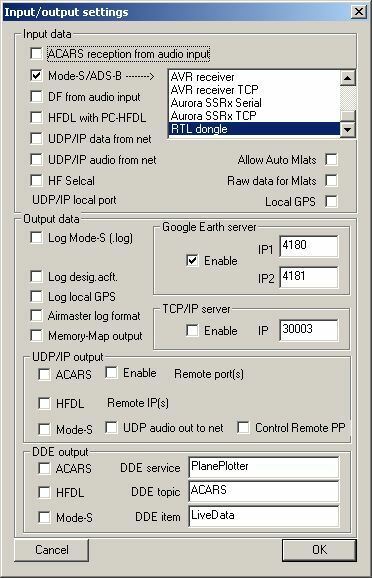 Be sure you have an up-to-date RTLSDR.DLL in your app folder. Why does the RTL1090 receive less packets/sec compared to SBS-1/3/Radarbox/Beast? The range is about the same. The sample rate is much lower, it is only 500 ns. How fast does my computer need to be? Win XP to 7, dont know about 8. Best is two cores for multithreading, though others will work. Average overall CPU load on a four core is 5%. Atom PCs seem not to cope with packet rate. What do the status fields at the bottom indicate? How can I tune the center frequency? Signals are broadband (rectangular pulses) and receiver bandwidth is 2 MHz. This needs no fine tuning. What is the Max/Min button for? You can test for reception range and gaps of your dongle. I receive a TCP server error 10053 or similar when shutting down Planeplotter! I am bothered by watching all these airplanes. I want to do the real thing with my dongle and watch TV. Where can I find the TV drivers? Dont forget to press the green button in Planeplotter! Jetvision is a brand of Günter Köllner Embedded Development GmbH, the leader in ADS-B, Multilateration (MLAT) and FLARM devices.